A few weeks ago I submitted a design concept to Twist Collective. Now, I already knew I was aiming kinda high, but I thought, what the heck! You don’t know if you don’t try, right? So, yeah, I got a very nicely-worded submission rejection letter in my inbox today, and even though my design won’t be in the Fall 2009 issue of Twist Collective, it didn’t discourage me from submitting designs in the future. Who knows, one day you just might see some of my stuff in there. 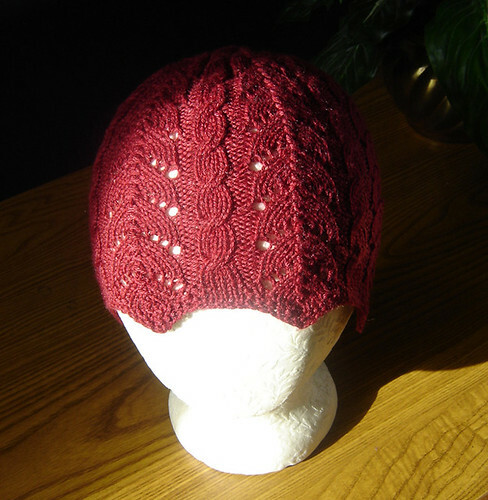 Instead, I’m going to knit up v 2.0 then self-publish the pattern. Want a little peak? Membership will be limited to 50 people. The colorways are to be club exclusives. Never to be sold by us. And it’s all super secret until you get your installment. Feel free to guess to your black heart’s contents. There’s actually a theme within the theme. We may even take pity on you and drop subtle hints. Then again, we may not…because we’re mean. Each skein will come with a little something COLLECTIBLE attached to the band. For more information please visit the Mean Girls Yarn Club web page. A few words about Stitches West 2009: Fantastic, Friggin Amazing and Awesome. I had an awesome time. But that’s a tale for another day. It’s a great design…glad you’re not letting rejection get you down! You never know why they reject, most time I’m sure it has nothing to do with the design but rather just doesn’t fit their theme. I bet that hat would look great on your Mom! That is a beautiful hat! Nice work. The hat looks pretty cool; I’m anxious to see the pattern. Not as anxious as I am about the Mean Girls Club; I hope I’m quick enough when signups begin! I’m going to sign up so that I can quickly put the skeins on eBay and sell them for eleventy hundred dollars because they are SOOPER EXCLUSIVE! Ooohhh..very pretty! I like the combo of cables and lacier columns. Lovely hat! I’ve had a couple of those rejection letters. They’re bummers, but I’m glad it’s not going to prevent you from trying again. I love the hat!!! Good for you for submitting it! The hat looks wonderful! And the club sounds good too! !